Two of radio’s most prominent and respected broadcast journalists will finally be heard in one program starting Monday (Jan 10) on the nation’s leading AM radio station DZMM Radyo Patrol 630 and top cable news channel DZMM TeleRadyo. 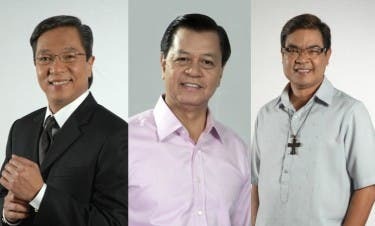 Beginning Monday (Jan 10), Noli “Kabayan” De Castro and Ted Failon will co-anchor the 30-minute early morning newscast “Radyo Patrol Balita Alas Siete.” Failon will also join De Castro in the 7:30am edition of the news and commentary program “Kabayan,” where they will take on the country’s most important issues from Monday to Friday. The two will also continue anchoring their respective DZMM programs in their new timeslots. De Castro goes solo in “Kabayan” at 6am, while Failon partners with Pinky Webb for “Tambalang Failon at Webb” at 8 to 10am. The joining of forces of radio’s biggest names is one of the many things to look forward to in DZMM’s new and bolder programming. Multi-awarded news anchor Julius Babao will also be on board weekdays for “Radyo Patrol Balita Alas Dose” every 12nn. Babao will also co-anchor DZMM’s flagship public service program “Aksyon Ngayon” with Kaye Dacer at 11am, following the tandem of Winnie Cordero and Ariel Ureta in “Todo-Todo Walang Preno” at 10am. Listeners and viewers will also be delighted to catch radio legend Bro. Jun Banaag’s “Dr. Love” show on the early afternoon slot, right after “MMK sa DZMM,” which will now air from 12:30pm to 1pm. Banaag will be playing standards and classic hit songs that will make listeners and viewers wax nostalgic from 1 to 3pm from Monday to Friday. Also moving to an earlier timeslot are Gerry Baja and Anthony Taberna, who will wake up the nation with their spot-on commentaries in “Dos Por Dos” at 5 am. ABS-CBN Head for Manila Radio Peter Musngi said these changes aim to further enhance the programming of DZMM, which has been the leader in radio broadcasting for longest time. “2010 was the biggest and most successful year for DZMM. We won over 20 awards, we were leading the pack in terms of ratings in both radio and cable TV, and most importantly, we were able to deliver service to many people. This year, it will only get better for DZMM, only because we want to give the best in news and public service to Filipinos worldwide,” he said. View the complete DZMM program schedule from Monday to Sunday at www.dzmm.com.ph. i’m a huge dzmm fan. i’m just curious why the changes are being implemented if 2010 was a great year for the station. seems like noli is shaking things up in abscbn talaga- sa tv tapos sa radio naman ngayon. powerhouse talaga .D NAKABAYAD C GOZ0N SA AGB KAYA WALANG LUMABAS NA RATINGS. si kapusong bobong #1., rigudon daw sa DZMM..
humihinga pa ba.. nakalibing na pala..
hayzzz DZMM leading AM Station in the Philippines and most awarded pa..
KUNG ANG HAPONTASTIC RIGODON, NGAYON SA DZMM NAMAN!